A journey that will take your artistic practice a step forward. Masterclasses are held at Summerhall Upper Church, SUMMERHALL, Edimburgo, Scotland and St. Margaret’s House, 151 London Rd, Edimburgo. Participants can select to attend the entire Academy, one or several masterclasses. Participants who complete the Academy will receive a Certificate of Completion issued by Charioteer Theatre and the Italian Cultural Institute. Explore the history, body language, motivations and social classes of Commedia dell’Arte characters with Enrico Bonavera. This masterclass will cover the physicality and voice of the Old Man, the Lover and the Servant. It will also cover the many variations of those characters including Zanni, Pantalone, Dottore, Isabella, Capitano, Arlecchino and others. Participants will analyse the interaction between Commedia characters, the social rules and motivations driving their behaviours. Participants will improvise Commedia canovaccis (basic texts) and create their own scenarios. Move from mask to character with Renzo Antonello, a Venetian mask maker who worked with Nobel-winning playwright Dario Fo. Renzo’s two day masterclass will introduce the mask as a transformative tool for performers. Participants will use a large variety of masks including neutral, larval and traditional Commedia dell’Arte masks. This masterclass is perfect for artists who want to learn approaches to character development based on the mask and standard Commedia characters, as well as theatre makers and scholars interested in mask making and design. 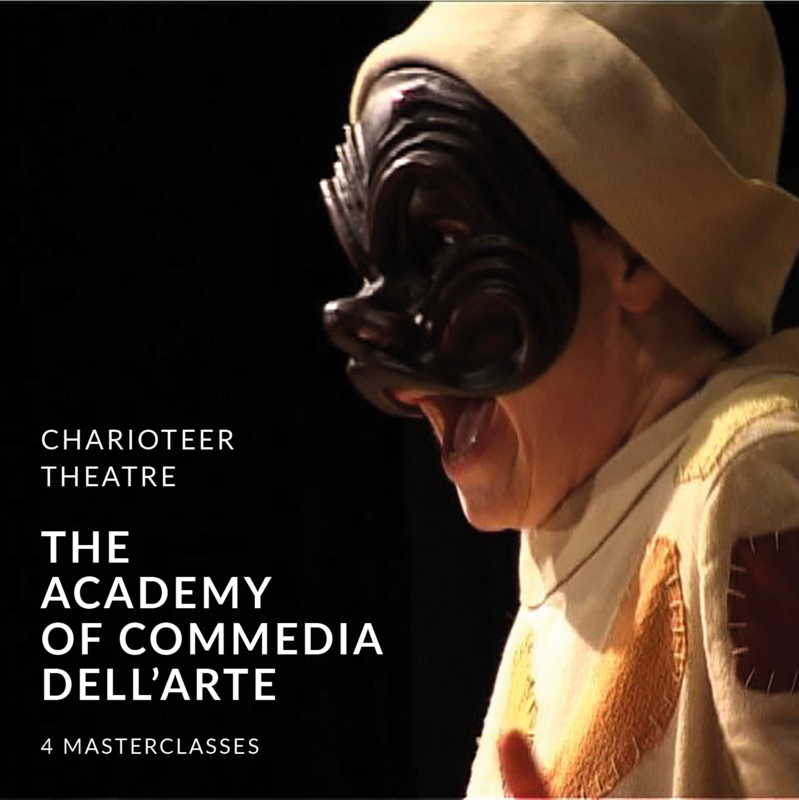 Master the fundamentals of Commedia dell’Arte and explore its relationship to the British stage and traditional European theatre with Olly Crick. This masterclass will cover the common Commedia dell’Arte themes including the relationship between the masked role, the unmasked role and the audience; the problems of class and social inequality; the comic principle of contrast; the dialogue between fear and heroism; the ambitions of the artistic soul against the basic needs of survival. Participants will learn about the legacy of Commedia dell’Arte in Shakespeare comedies and the application of it to modern performing arts. Participants will also develop scenarios and learn how to use appropriate dramatic materials to keep the masks alive. Build a Commedia over two days with Stefano Guizzi. This two day masterclass explores canovaccis, scenarios and the dramatic path of Commedia dell’Arte characters. Participants will work with partituras, street-jam, verbal improvisation, lazzis (inventions, gestures, gags) and set choreography in combination with the physicality and voices of Commedia dell’Arte characters. At the end of the workshop, participants will share their work with the group, and potentially to a real audience, applying the principles of live performance interaction. All the masterclasses will be introduced by a conference held on April 6, May 11, Giugno 15, July 13 by Enrico Bonavera, Renzo Antonello, Olly Crick and Stefano Guizzi, respectively. The conferences are co-hosted by the Italian Cultural Institute of Edinburgh and will take place at the Artiscience Library at Summerhall at 6pm. Enrico Bonavera is a tutor for the Commedia dell’Arte Academy at Piccolo Teatro in Milan, directed by Ferruccio Soleri, and Shapkin Theatre School in Moscow. He was awarded Best Supporting Actor at the Borgio Verezzi theatre festival for his Arlecchino in Carlo Goldoni’s I due gemelli veneziani. He won the 'Golden Arlequin’ in Mantua – an award previously held by Marcel Marceau, Dario Fo, Ferruccio Soleri, and Carolyn Carlson. Enrico Bonavera studied with Eugenio Barba and Jerzy Grotowski, and is known to have performed as Brighella e Arlecchino in Giorgio Strehler’s Servitore di due padroni at Piccolo Teatro of Milan. He teaches regularly also in Lyon, Pisa and Genoa. Renzo Antonello is a Venetian mask maker who specialises in leatherwork and mask making at Accademia di Belle Arti. He currently possess 150 models of masks and runs regular workshops in Italy. His collaborations and workshops include work with acclaimed mask maker Donato Sartori, Nobel-winning playwright Dario Fo, Piccolo Teatro of Milan and Yale University. Olly Crick is an Artistic Director who trained in Commedia dell’Arte with Carlo Boso, Feruccio Soleri, Marcello Magni, Phillipe Gaullier, John Wright and Barry Grantham. Currently completing a PhD on the dramaturgy of modern Commedia dell’Arte, Olly co-wrote Commedia dell Arte: Troupes and Groups with John Rudlin and co-edited The Routledge Companion to Commedia dell Arte. He taught Commedia at RADA, LAMDA and the Guildford School of Acting. Olly has performed with Unfortunati (as the Doctor), and founded the Fabulous Old Spot Theatre Company (Gloucestershire) and the Fabulous Lancashire Revels (Ormskirk). Stefano Guizzi is a Commedia dell’Arte tutor at Milan’s University (La Cattolica) and co-directs the Granara Festival of independent theatre in Granara EcoVillage, near Parma. Past work as an actor includes Porgy&Bess, the Barbiere di Siviglia and the Elisir d’Amore for children at Milano’s Teatro alla Scala. Stefano has worked with Bob Wilson (Saints and Singing, Berlin Hebbel and Schauspielhaus, 1997-99), Gigi Proietti, Andrée Shammah, Gheorghe Iancu, Stefano De Luca, Guido de Monticelli among others. He trained with Giorgio Strehler at the Piccolo Teatro in Milan, where he still performs today.